High capacity and complete control in one quiet machine. Flat clinch mechanism means neater stacks of paper. Flip-up alignment guides and illuminated staple placement help with perfect stapling results. Manufacturer's limited five-year warranty. Included an adjustable depth guide for accurate positioning. Stack height gauge ensures your paper stack doesn't exceed the maximum sheet count. Our office has had this stapler for 2 years and I think we may have killed it. Need help to see if we can fix the latch that keeps the staples in once replaced? Is there anyway to fix it or do have to replace the stapler? We really love this stapler!!! Since I purchased this higher capacity stapler I no longer have to struggle to staple larger groups of paper. Have had over a year with zero jambs! I also like the storage drawer for spare staples. Swingline thought of everything with this one! Yes, it's expensive but do some comparison shopping. There's some good deals out there! We received the Electric stapler as a gift from you and cannot tell you how much it is "loved" by all in the office. We have such a variety of your Swingline products in our office that I know we would be in a huge predicament without them. I bought a refurbished Optima 70 electric stapler for my boss because she had purchased at least 5 staplers over the last year and none of them would hold up to the amount of sheets she was stapling. This stapler is amazing! We have been using it for about 6 months now and have had no issues besides a staple stuck in in every once in a while. I am glad I was able to find one refurbished because the price of the new ones is really high but I would say it was worth it. Welcome to MyBinding video. 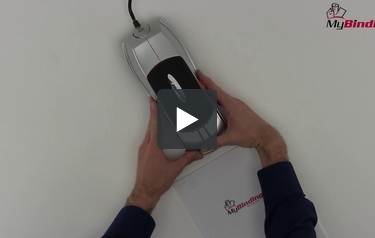 Let's check out Swingline's Optima 70, an electronic desk stapler. High capacity and complete control in one quite machine, that's the Optima 70. Loaded with small features that allow customization and working with your projects and your needs. Loading staples are simple, dare I even say fun, push the button in the back, out pops the carriage, pull it all the way out, load the staples, push it back in and you're in business. Dual sliders give you depth of margin control for your staples and you can switch from automatic to manual punch with the flip of a switch. Some people just don't like automatic and the manual gives you more control. The Optima 70 can punch up to 70 sheets of 20 pound paper in a single punch and finally, you have even more control with multiple guides so that your entire run can be consistent. There it is. That's the Optima 70 by Swingline. For more demos, reviews and how to's, check out MyBinding.com. Staple "holder" will not push all the in to the "latch" position, consequently the stapler is not working. Any way I can disassemble the cover to try to repair this unit? We are very sorry you are having issues with your stapler. Swingline actually has a help line you can call at 877-234-3192. They should be able to help you with your stapler. If you are still having issues after speaking to them, please let us know.